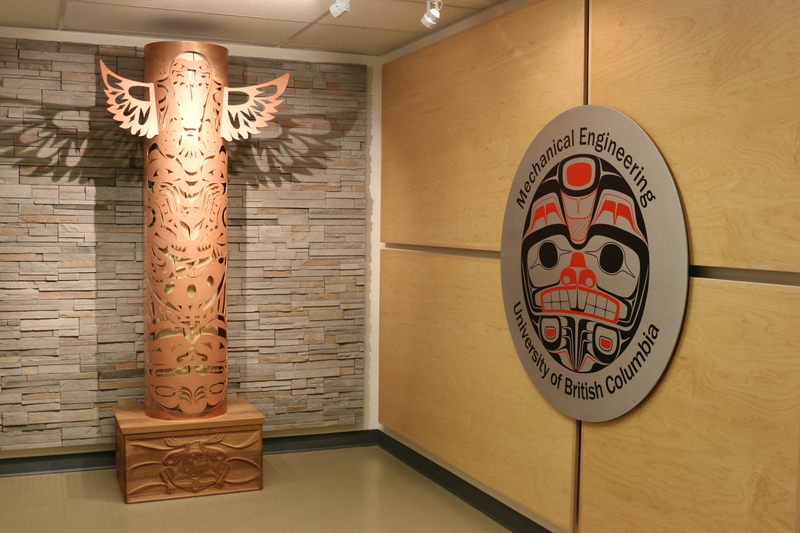 For the past three years, visitors to UBC’s Mechanical Engineering department have been greeted by Eena, the beaver in the department’s crest that hangs just outside reception. Now, as of February 22nd, Eena is joined by several new faces, who both welcome us and share with us a story about a great artist, colleague, and friend. About 18 months ago I commissioned Alan to create a second piece for the Department. My vision was to have a pole that would welcome visitors and be emblematic of the inclusiveness of Mechanical Engineering. My only request was that the pole include elements of the sea, land, and air, to represent the fact that Mechanical Engineering is impactful in all three domains. Alan built on this rudimentary framework to create a sketch of the artwork he envisioned. 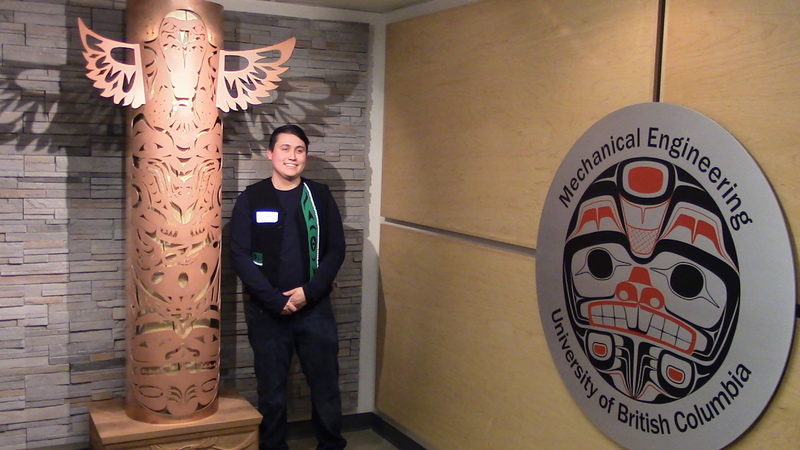 Alan imagined a unique totem pole perched on a stacked pair of bentwood boxes. The pole itself would be fabricated by water-jet-cutting patterns into a thin copper sheet, and bending the sheet around a cedar pole. He selected figures for the pole that would be at home in the sea, on land, and in the air. Following Alan’s untimely passing [just 2 months after the pole was commissioned] I decided that the artwork Alan had sketched should be completed, and would become a tribute pole to recognize Alan’s many impacts on Mechanical Engineering. I sought guidance from Don Fiddler, District Principal for Aboriginal Education of the Vancouver School Board, about artists who could fulfill Alan’s vision. 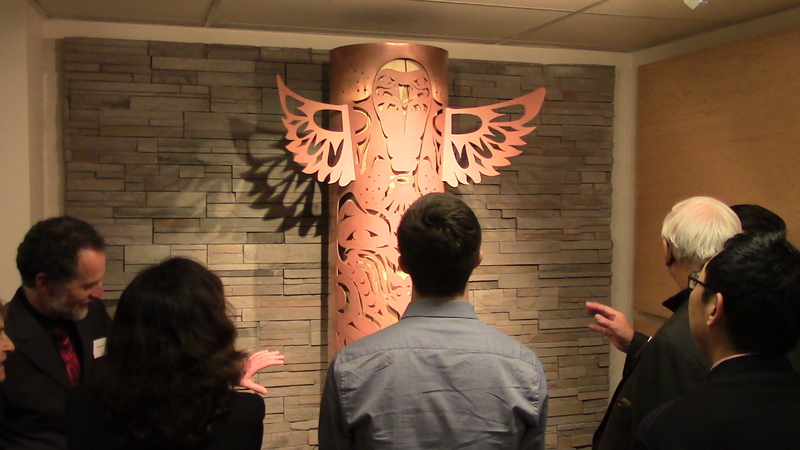 Don kindly introduced me to James Harry, an artist from the Squamish Nation who has experience creating art from rolled sheet metal. Over the course of the last year James has worked, with some assistance from Erik Wilson of my Department, to create the artwork we will see shortly. [… ] James has respectfully expanded on Alan’s vision to create a work that combines elements of his and Alan’s Indigenous traditions, and modern fabrication techniques. James has created a work of beauty—it is a work that illustrates what we can accomplish when we work in harmony. 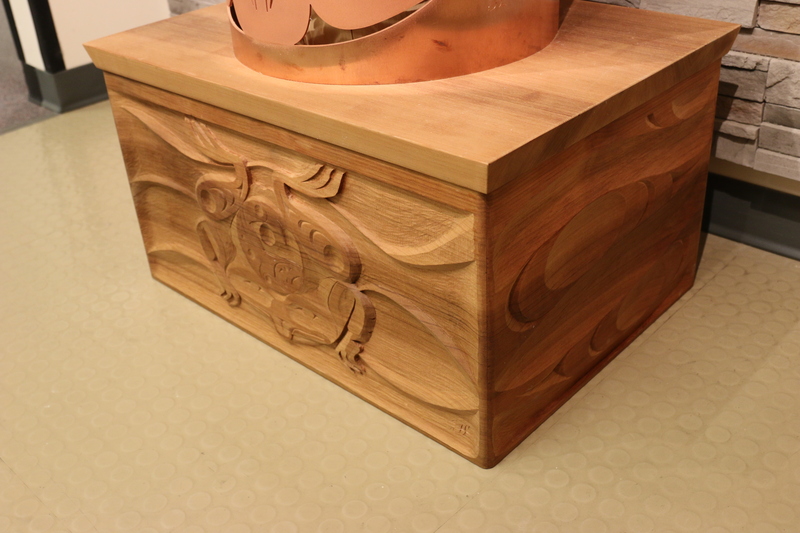 The bentwood box on which the pole sits (which Harry explained is not an actual bentwood box because it is sealed on the sides) was built by one of the department’s Machine Shop technicians, Erik Wilson, and carved by Harry. The carving on the front shows a frog, salmon, and egg, which Harry said represents rebirth, broadly, and Alan’s death specifically. “We [local First Nations communities] don’t believe that when somebody dies, they’re gone forever,” he said; “they are reincarnated into another animal.” On the back of the box is the Coast Salish eye, a symbol, according to Harry, “that we’re always being watched over by a greater force in the world, a greater being.” In keeping with this theme of bridging past and future, the department has placed a time capsule inside the box, to be opened fifty years in the future. The pole is a symbol of collaboration. 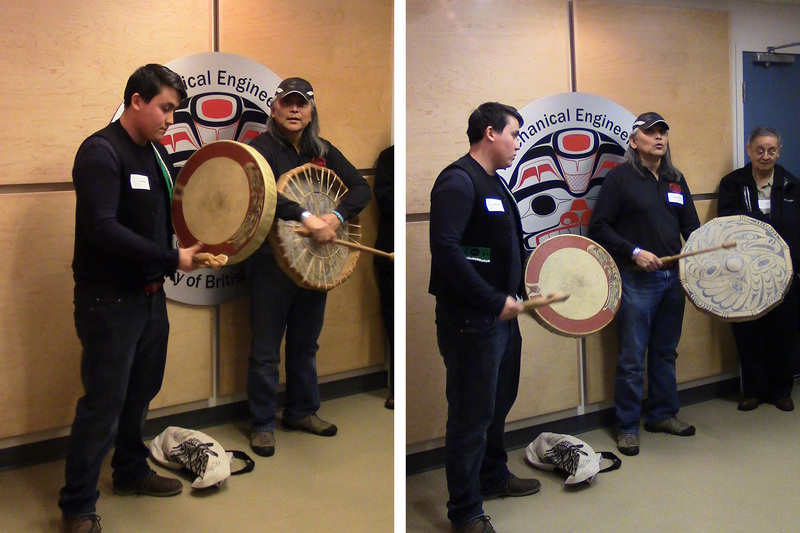 It incorporates elements of traditional Squamish, Kwagiutl, and Kwakwaka’wakw art forms and materials; the artistic visions of artists here and gone; the values of the Mechanical Engineering department; and the production methods of engineers, machinists, and traditional First Nations artists. 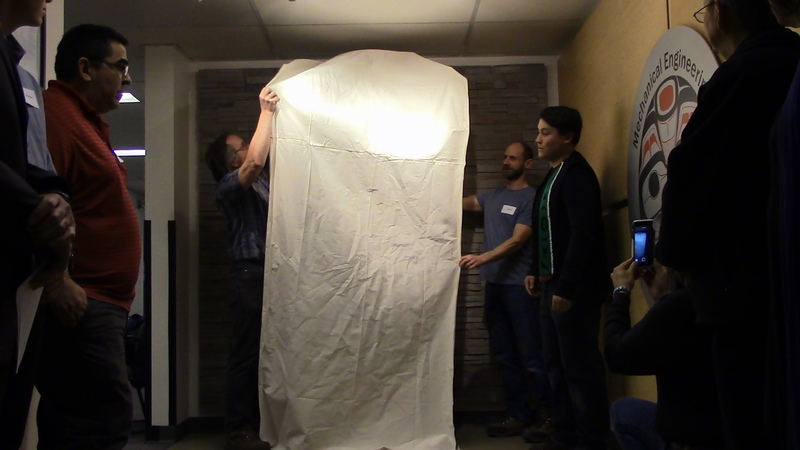 In addition to the collaboration within the pole’s production, its unveiling was also a collaborative event. The unveiling ceremony opened with a welcome to the Musqueam territory in the native language by Larry Grant, Elder in Residence of the First Nations House of Learning. This was followed by a witnessing ceremony. “Whenever we have an important event like raising of artwork,” Harry explained, “we bring people together and pay them 50 cents—representing the cost of a blanket, as we traditionally paid people with blankets—to remember what happened that day, and to come and speak about it if they are ever called forward in the future to retell the story.” Partaking in this witnessing ceremony were Don Fiddler, District Principal for Aboriginal Education, Vancouver School Board; Linc Kesler, Director of the First Nations House of Learning; Xwalacktun Harry, James Harry’s father; and Kerry Steeves, Alan Steeves’ brother. 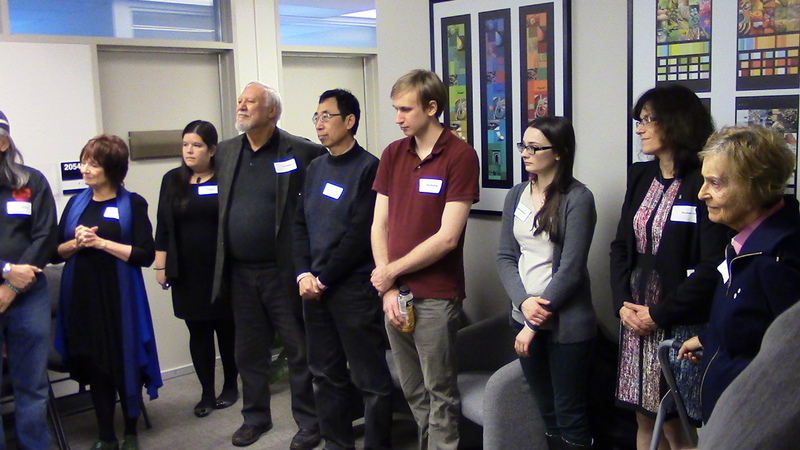 In addition to the aforementioned and the artist, the event was also attended by Wayne Sparrow, Chief of Musqueam; Leona Sparrow; Ronnie Ross, grandmother of James Harry; Alison, Evan, and Liam Steeves, Alan’s sister-in-law and nephews; Elizabeth Croft, Associate Dean of Education and Professional Development (Faculty of Applied Science); James Olson, Associate Dean for Research and Industrial Partnerships (Faculty of Applied Science); Martha Salcudean, Professor Emerita (Mechanical Engineering); Carl Olliver-Gooch, Professor (Mechanical Engineering); Steven Rogak, Professor (Mechanical Engineering); Markus Fengler, Lecturer (Mechanical Engineering), Eric Wilson, Technician (Mechanical Engineering); Jennifer Pelletier, Manager of Technical Administration and Industry Relations (Mechanical Engineering); Jay Zhou, ITS Systems Support (Faculty of Applied Science); and several students. 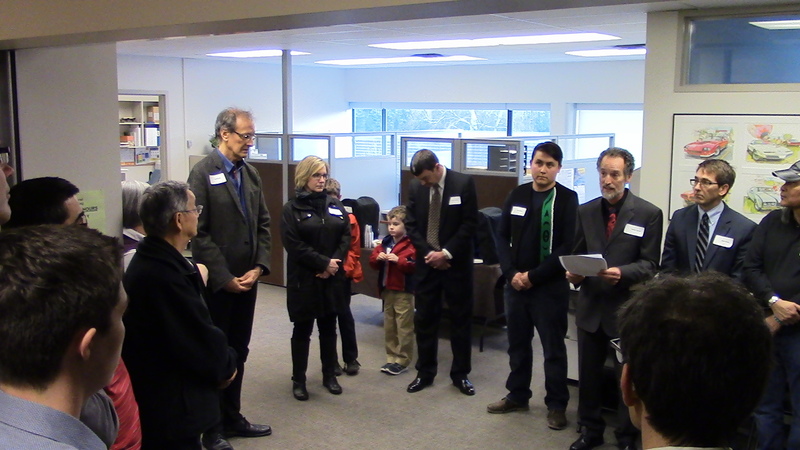 Photos of the unveiling ceremony can be found below. The department hopes that this story will be remembered for many years, and that the pole that welcomes visitors to the department will remind them of the department’s commitment to fostering a community of collaboration and inclusiveness. At all major events at UBC we recite the words that UBC is located on the traditional, ancestral, unceded territory of the Musqueam people. What do these words mean? What they mean is that the colonial governments systematically pushed First Nations off their land. Not satisfied with just stealing First Nations land, the government, with the complicity of some churches, attempted to expunge First Nations cultures by forcing young Indigenous children to attend residential schools. The treatment of children at those schools was racist, dehumanizing, and despicable. I believe that the government’s treatment of the Indigenous peoples is the single greatest stain on our history. As a sign of our commitment to treating Aboriginal communities respectfully, last year the Department set the goal of raising funds to endow in perpetuity an award named after Alan. 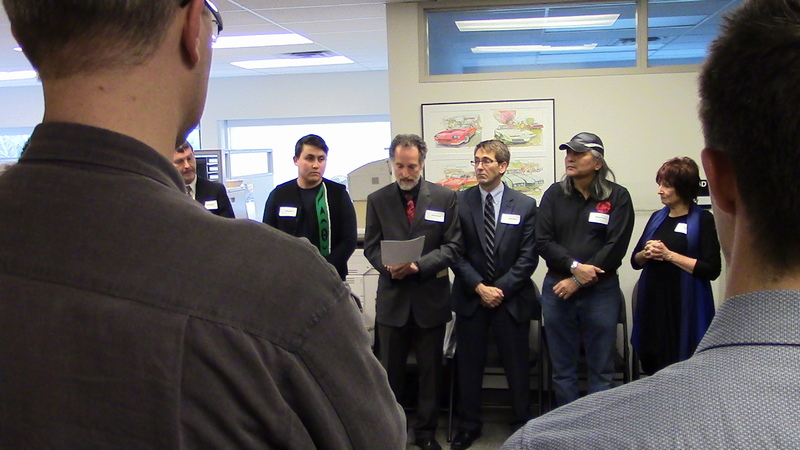 I am pleased to report that those funds have been raised and the Alan Steeves Memorial Award will be used to help Indigenous students studying in Mechanical Engineering. The Department has also committed to a ten-year plan of outreach to local First Nations communities, with the goal of encouraging young Aboriginal students to consider a career in Engineering. We look forward to welcoming many more Indigenous students. Finally, there is this tribute pole. If the presence of the pole makes even one Aboriginal student feel more welcome, or makes one non-Aboriginal student think about our history, it will have served its purpose. James Harry was born in 1989. He is of Squamish Nation and European descent. At an early age, he began carving with his father, Xwalacktun. In secondary school, James began his career as a professional artist, carving the door panels of the BC Aboriginal Sports Hall of Fame. He later attended Emily Carr University of Art and Design, obtaining a Bachelor of Fine Arts Degree in 2014. As an ECUAD student, James received scholarships and bursaries in recognition for his rigorous art practice and academic success. The YVR Art Foundation honoured him in 2011 with the Career Artist Scholarship. 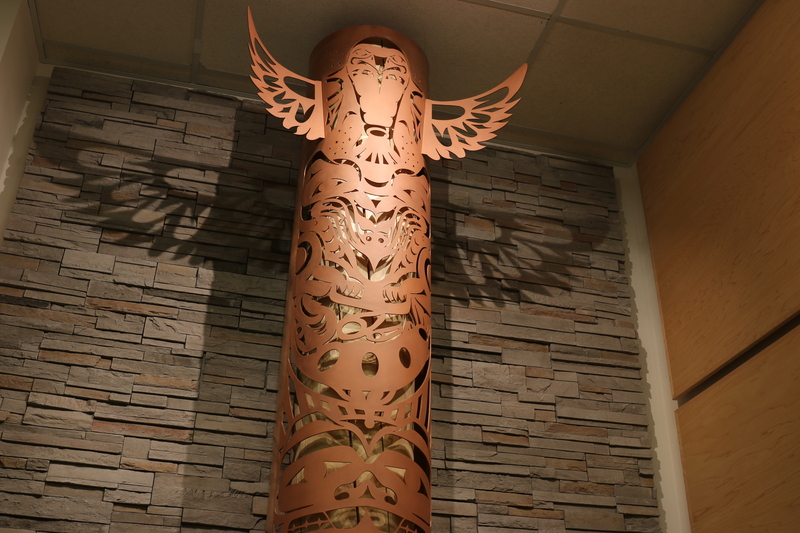 This allowed him the opportunity to create “From Sea to Sky,” a 6‘ high aluminum totem pole that emitted light through Coast Salish Iconography cut by water jet. In the same year, James completed a co-op internship with various artists in the United Kingdom where he learned metal casting and taught Aboriginal sculpture, painting, and drawing in Scottish communities. 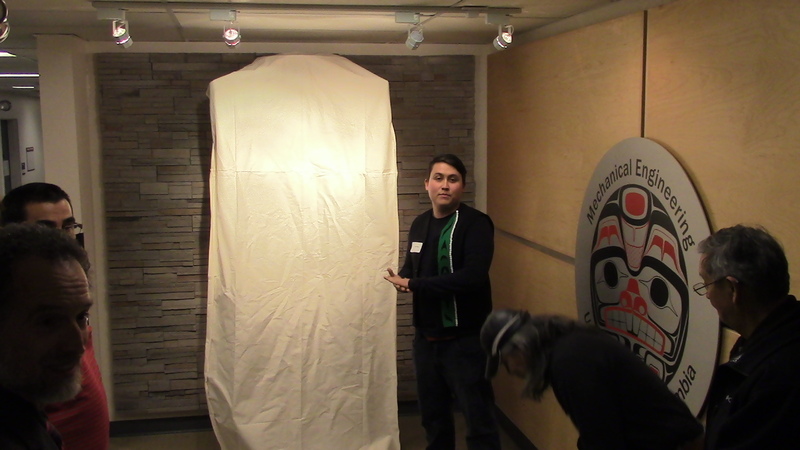 Currently James is involved with the Vancouver School Board Artist in Residence program where he teaches Coast Salish art forms and Formline in the Vancouver school district. I spent most of my childhood and early adolescence learning First Nations form and design from my father, Xwalacktun, a master carver of the Squamish Nation. I developed my own techniques and artistic methodology after fully understanding the traditional foundation of his work. Materials I turn to are metal, red and yellow cedar, lighting and paint to create installations and sculptures. I have been given the unique opportunity to approach my art from the different perspectives provided by my complex ethnic background: Euro-Canadian, Coast Salish and Kwakwaka’wakw. I feel the responsibility to represent the values of my culture and heritage. I explore concepts of West Coast Aboriginal artwork through the combination of familiar symbolisms which pushes the boundaries of First Nations cultural traditions and the way the world functions around the confines of these understandings. I want to broaden the place held by Native art and culture in the world of contemporary art.